For a strikingly unusual cat, it is hard not to fall in love with the Birman, or 'Sacred Cat of Burma' as it is known in its native country. This cat carries itself with much poise and 'wears' a pale coloured coat, dark face, ears, tail and legs with white 'gloves' on its feet. Its eyes are a beautiful, deep sapphire-blue. In fact, these cats are born from a famous legend that explains away their unique colouring. One hundred pure white cats lived in the Burmese temple of Lao-Tsun but one night the temple was raided and the oldest priest was killed. 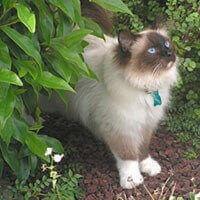 His pure white cat, Sinh, jumped on the body of his master and the priest's soul entered the cat. As it did so, the white hair of his body became golden (similar to the temple goddess), his legs, face, ears and tail became earth coloured and his paws remained white as a symbol of purity. Now with a romantic tale like that - who wouldn't want to own this cat! While regular grooming is essential, their glorious coat is more silky than fluffy and rarely matts, making it relatively easy to maintain. These cats are softly spoken and are a lot more active than Persians, but less active and talkative than Siamese cats, making them an ideal breed for children or anyone looking for an exotic, indoor pet.